If you missed out on the first DJ Hero but are thinking about buying the sequel, Activision's willing to give you the first game for free. 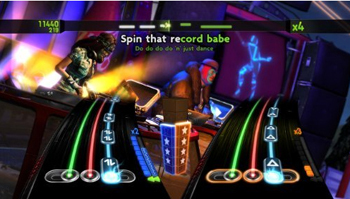 If you're planning to pick up DJ Hero 2, then good news: Activision is going to give you a free copy of DJ Hero as an extra treat. However, this deal is only applicable if you happen to be picking up either the Party or Turntable Bundles. If you're buying the game for yourself, then you'll probably just want to pick up the Turntable Bundle, which is selling here in North America for $99.99. The Party Bundle, meanwhile, is $150, but comes with two turntables instead of the usual one. While DJ Hero certainly enjoyed some brisk sales, it wasn't exactly the blockbuster that so many people expected it to be. It seems likely that the publisher really wants to make the sequel more appealing for consumers by giving them some extra bang for their buck. That said, this sale bonus is a great deal, especially if you never picked up a copy of the first game.